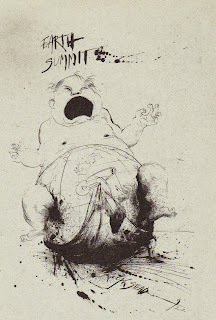 As I was very focused in the 1980s on UK domestic politics my first awareness of Maurice was not until the preparations for the Rio Earth Summit. By then I was at the United Nations Association – UK organizing town hall conferences in preparation for the Summit and an Earth Summit Rally. To supplement this, we had asked Maurice to write an article for the magazine we were producing to be sold in WH Smiths in the UK and a free four-page tabloid that would be given out at the town hall meetings. If you are not of that generation it is very difficult to properly understand the impact that the Earth Summit in 1992 had not only on key environmental issues but also on the opening up of the United Nations to stakeholders. 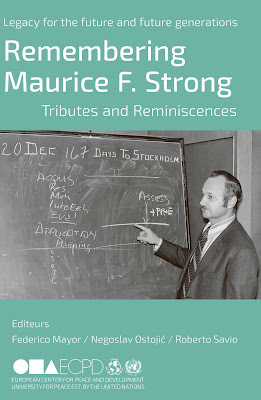 It helped a lot, I think, that Maurice had already organized Stockholm in 1972 and served as Executive Director of UNEP – the first one – and been part of the Brundtland Commission. 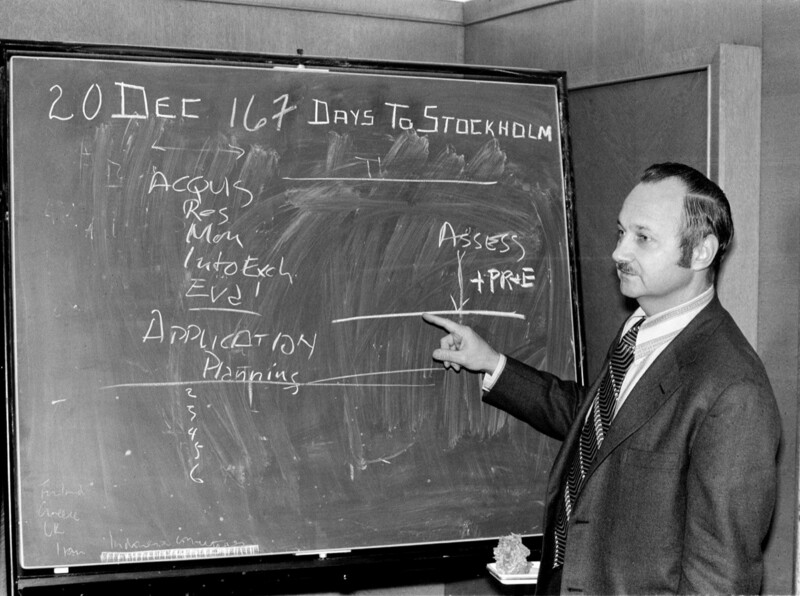 He had also been an industry leader as well as an NGO leader in the years after Stockholm. He knew how the intergovernmental world worked, knew the key issues that needed to be moved forward, knew the key players and was able to craft the right coalitions to deliver on these issues. Being in Rio and caught up in the energy and belief that we had identified the problems and embarked on a clear journey to address them was an indescribably empowering moment. The Summit would have been an incredible achievement with just these developments, but on top of these developments also emerged a new UN body to monitor Agenda 21: The Commission on Sustainable Development. Within two years, a third convention on desertification and a treaty on straddling fish stocks would be agreed upon and, by the end of the decade, negotiations would begin on two further conventions regarding persistent organic pollutants and prior informed consent procedure for certain hazardous chemicals and pesticides in international trade, respectively. These developments meant so much in terms of progress for international environmental law, and they were all put into motion by the one and only Maurice Strong. Within ten years, over six thousand local Agenda 21s were created across the globe with local authorities acting as facilitators in working with their local stakeholders to imagine their communities becoming more sustainable. 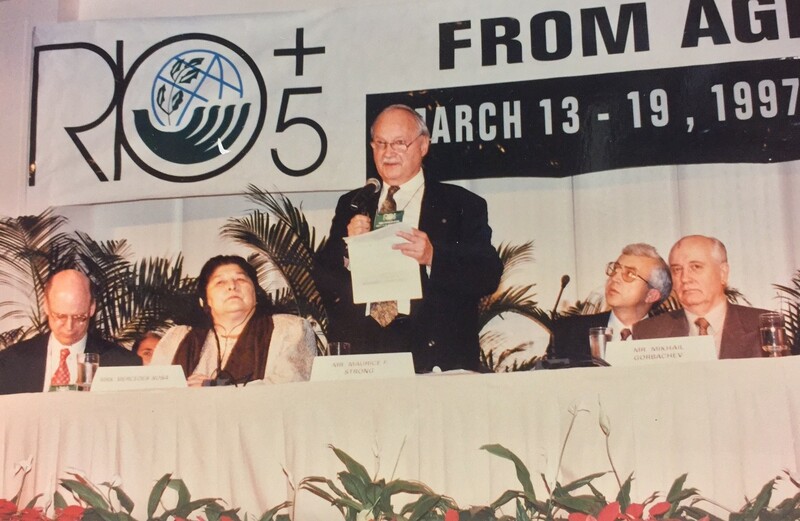 Maurice recognized that there were gaps in critical stakeholder groups, so in preparation for Rio, he had helped establish the International Council for Local Environmental Initiatives (ICLEI) in 1990 which brought together local authorities that wanted to work on sustainable development. “solve the single most urgent problem that faces the human race today – that of preserving the environment for ourselves and for the generations to come” (Falkner, 1991) This brought the progressive CEOs into the Summit preparations. The approach to stakeholders was subsequently picked up in the follow-up to the Earth Summit. 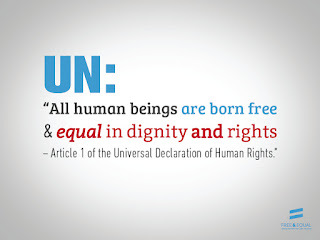 By the ten-year review in 2002, over one hundred governments created multi-stakeholder commissions, committees or councils to develop and help implement Agenda 21. UN bodies were also reorganizing their engagement strategies around a stakeholder discourse as opposed to a civil society discourse. This was all due to Maurice’s vision. I didn’t engage much with Maurice in the 1990s except around commentary on some of the reform activities he was spearheading for the UN Secretary-General. We both spoke in September 2001 at the International Eminent Persons Meeting on Inter-Linkages in Tokyo on how to bridge the problems and solutions to address sustainable development in preparation for the World Summit on Sustainable Development. 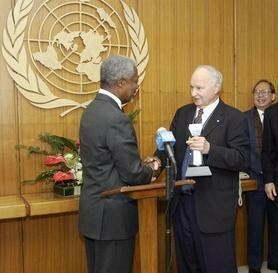 In our conversation, I remember him vividly promoting that it should address the emerging environmental security agenda. It was an agenda I had been aware of; in the Earth Summit 2002 book I edited, there was a chapter by Margaret Brusasco McKenzie on the subject. WSSD didn’t address this agenda, but by the 2005 World Summit it was in the political discourse at a level never seen before. Water, Energy, Food or Climate Security, and Resilience stories were now common in the news media. Again, Maurice was ahead of his time. 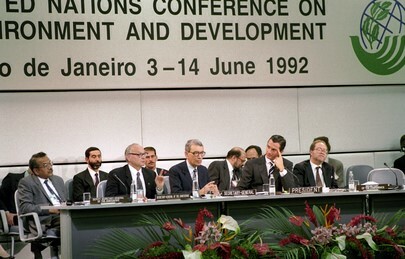 My memories of that event were discussing in the margins with Maurice and Andrew Steer, who was then Director General at the UK Department of International Development (DFID), the idea of Maurice again being Secretary General for a UN Conference – Rio+20. It wasn’t going to happen, but he would be able to play a supporting role throughout. 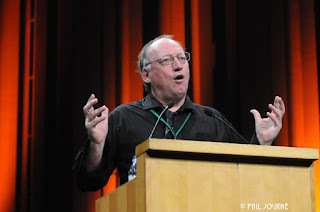 In preparation for Rio+20, Michael Strauss and I had the pleasure of working with Maurice on the book Only One Earth: The Long Road via Rio to Sustainable Development. The book told the intergovernmental story from before Stockholm to the final preparations for Rio+20. Our hope was for the book to highlight the successes, but at the same time provide a realistic assessment of the failures. In particular, we reminded readers that the dialogue on sustainable development happens in a world where peace and security issues tend to trump (no pun intended) any progression on sustainable development. “Many of you in this room today will play a significant role in what will be achieved or not. We live in a time of great challenges on so many fronts that sometimes the issues we talk about today are lost in the noise of war and peace. But there are also great opportunities with building an inclusive and green economy that will bring jobs and a cleaner and more sustainable planet. In the final analysis, all that can be asked of us is whether or not we tried to contribute to make the planet a better place for the next generation to live in. In the case of Maurice Strong – the father of sustainable development – there is no question he inspired us all to do more, he cajoled us when we were faltering, he berated us when we were going in the wrong direction. 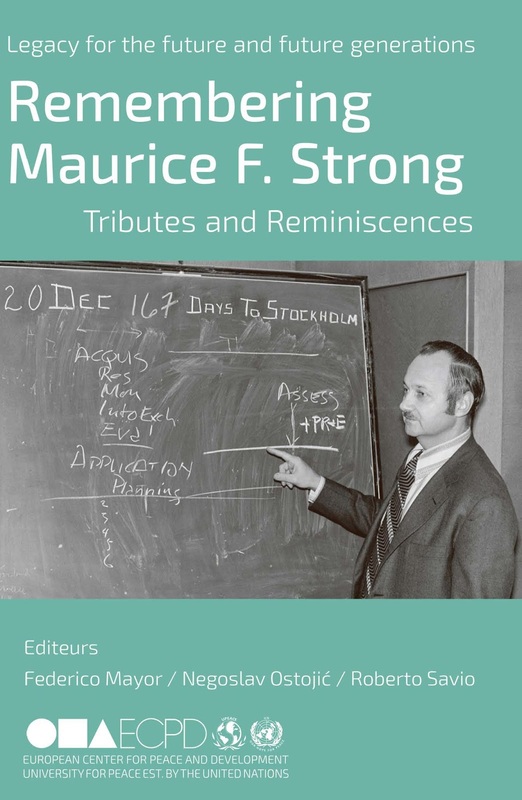 He kept us on the path or as close to a path towards a more sustainable world and for that, we should all rejoice in being part of the life and times of Maurice Strong. I know I do.